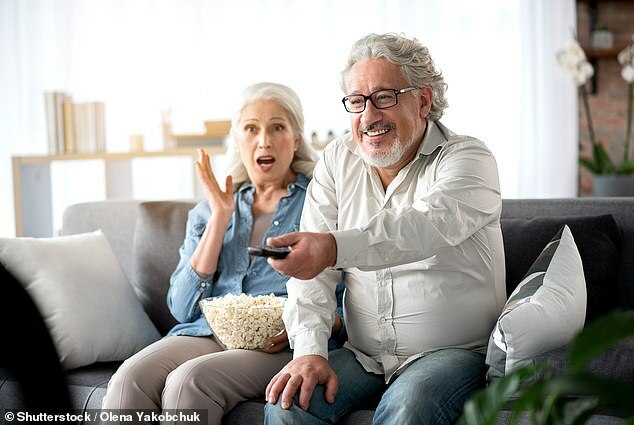 The over-fifties who watch more than three-and-a-half hours of television a day are more at risk of memory loss, research suggests. A study of more than 3,600 older adults revealed watching too many soaps, documentaries or reality shows reduces their ability to recall words by up to ten per cent. Overindulging in your favourite shows could trigger a ‘cognitive stress’ that leads to memory loss, the researchers claim. It may also take away from activities that keep older people sharp, such as reading or playing educational games online. The research was carried by University College London and led by Dr Daisy Fancourt, senior research associate in the department of behavioural science and health. ‘There has been interest for over a decade in the effect of television viewing behaviours on cognition, but much of this literature has concentrated on children,’ Dr Fancourt said. To uncover how TV affects older people, the researchers analysed 3,662 adults aged 50 or over from the English Longitudinal Study of Ageing. The adults were asked in 2008-to-2009 and again in 2014-to-2015 how much television they watch every day. They also took part in a series of word-related memory tests. Results – published in the journal Scientific Reports – revealed those who watched more than 3.5 hours of television a day experienced an average ‘verbal memory’ decline of between eight and ten per cent over the six years. State-of-the-art brain-imaging technology can distinguish between natural age-related memory loss and Alzheimer’s, research suggested last March. A study took brain scans while its participants performed object-based memory tests. Results suggested Alzheimer’s patients have a loss of signalling in the region of the brain known as the anterolateral entorhinal cortex. Signalling losses do not occur in people suffering normal memory decline, such as forgetting where they left their keys or someone’s name. The anterolateral entorhinal cortex is thought to regulate communication between the region of the brain where information is first encoded and where it is stored long term. This cortex is also one of the first regions in the brain to develop protein plaque tangles, which are associated with dementia’s onset, past studies suggest. This is compared to a 4-to-5 per cent decline among those who watched less TV. The findings remained true ever after adjusting for factors such as exercise, and the time spent sitting or online. Dr Bob Patton, a lecturer in clinical psychology at the University of Surrey, claims TV has been linked to changes in the viewer’s brain’s structure, particularly in the regions responsible for learning and memory. And Dr Patton – who was not involved in the study – added different parts of the brain are stimulated when we watch a comedy versus a drama or documentary. But it is unclear whether the type of programme a person watches influences their risk of cognitive decline. ‘Watching television may have educational benefits from watching documentaries and relaxation benefits as a way of reducing stress,’ Dr Fancourt said. Professor Andrew Przybylski, director of research at the Oxford Internet Institute, University of Oxford, said: ‘What this scientifically-sound study tells us is being a couch potato is bad for the over-50s because it is associated with poorer verbal memory. ‘There is still a lot we don’t know, such as whether memory reductions are affected by what we watch, whether we watch alone or whether you interact with the TV like those on Gogglebox. ‘We also don’t know whether changing behaviour would improve memory. Chris Allen, senior cardiac nurse at the British Heart Foundation – which part-funded the study – also stressed cognitive decline ‘is not the same as dementia’. But vocabulary is one of the first things to go in Alzheimer’s patients, with the disease often being diagnosed via word tests. ‘If you’re concerned the amount of television you’re watching could be having a negative impact, we would advise limiting the amount of TV you watch each day and working in some heart healthy hobbies to your routine,’ Mr Allen said.